Cradle of Rome is rated 4.2 out of 5 by 31. 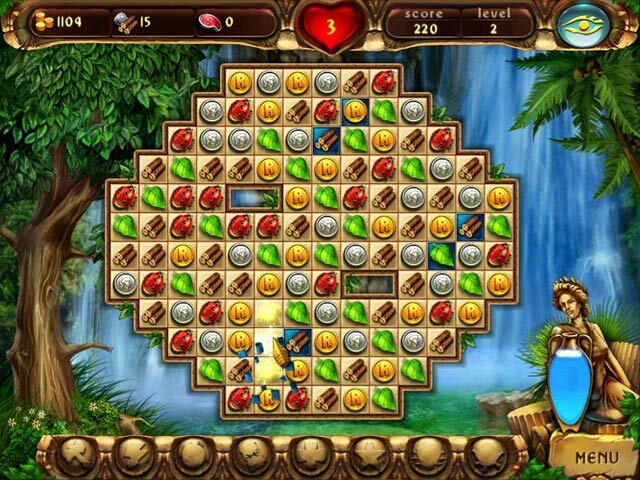 Rated 5 out of 5 by Bettyvander from Great game Best match three game I've played. Gives lots of time to build up "lives" for when it gets really hard. And it's so much fun, I don't really mind starting all over if I use up my lives. Rated 5 out of 5 by pgardens from Was therapeutic My husband fell and had a brain injury, his Therapist said to play this game (along with other games) because he needed something that moved his eyes around and not be in a stagnant stare. He played this game every day and over time his injury got better. But this one was his favorite and he still plays this game every day. Rated 5 out of 5 by mrsfussybutt from Cradle of rome great time waster, I've played this game over and over and over again. Cradle of Rome 2 is just as good if not better. 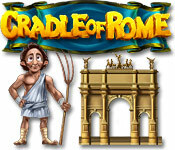 Rated 5 out of 5 by jetter45 from Cradle of Rome I love this game! I bought it a while back, but my computer crashed and I lost all my games.. This one is well worth the money.. Rated 5 out of 5 by truedreamer from THIS IS A GREAT GAME, I LOVE IT EVERYONE SHOULD JUST TRY IT AND YOU WILL GET ALL INVOLVED IN IT TOO. IT MOVES ALONG AT A GREAT PACE AND IS JUST PERFECT FOR AN AFTERNOON OF RELAXING ACTIVITY. THANX! SORRY FOR THE CAPS BUT I CAN'T SEE THE SCREEN VERY WELL, I"M NOT SHOUTING. Rated 5 out of 5 by pennmom36 from Cradle of Rome I have played hundreds of match 3 games and none of them can hold a Roman Candle to the Cradle of Rome series. I have purchased every game in this series as soon as they are released and the original game is by far the most challenging and most addicting game. When I say addicting I'm not kidding because everyone I've convinced to play, spend hours playing this game so proceed with caution. The goal is to turn all of the blue cells on the board by making matches on them. 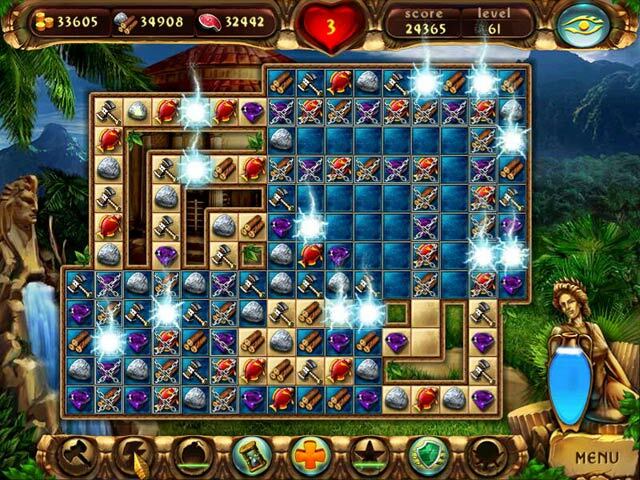 You earn bonuses that will help you progress, a Hammer for a single tile, Lightning for destroying several random tiles, a Bomb for a specific group of tiles, Shields for destroying a line of your choosing, a Star for destroying all tiles of any one type and a scarab to mix up all of the tiles. Some tiles are blocked by one chain and even 2 chains as you progress which require several matches to break both chains. 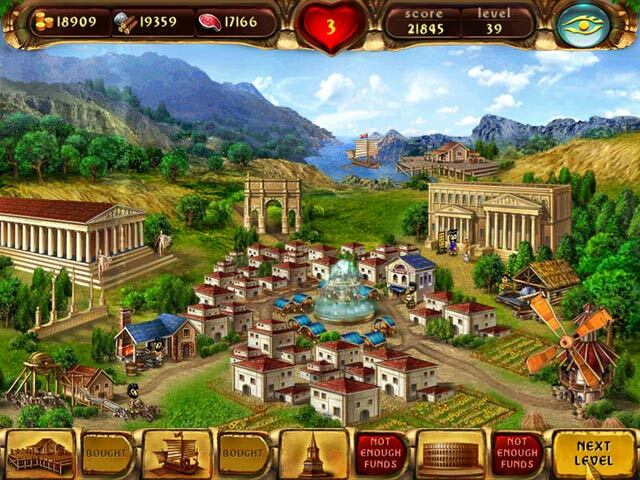 As you make enough resources and money you build a Roman city and progress with the times, and each building requires you to do specific tasks in order to earn bonuses quicker and earn valuable resources. If you right click on any of the buildings, you can find out what is required (in Cradle of Rome 2 the tasks are more specific) enjoy!